Italian sports car brand Ferrari said that its shipments totalled 9,251 units in 2018, up 853 units or +10.2 per cent compared to the previous year. This achievement was driven by a 19.6 per cent increase in sales of our 12 cylinder models (V12), while the 8 cylinder models (V8) grew by 7.3 per cent, a company statement said. The V12 performance was mainly led by the 812 Superfast, partially offset by lower sales of LaFerrari Aperta that finished its limited series run. V8 performance was led by the ramp up of the Ferrari Portofino as well as the newly launched special series 488 Pista. Growth in shipments occurred across all regions: EMEA grew 13.1 per cent, Americas increased by 6.7 per cent, China, Hong Kong and Taiwan, were up 12.6 per cent and Rest of APAC was up 7.8 per cent. Net revenues for 2018 increased by a few million to Euro 3.42 billion ($3.91 billion), up 0.1 per cent at current currency and up 3.2 per cent at constant currency. Revenues in Cars and spare parts (Euro 2.535 billion, +3.2 per cent at current currency or +6.9 per cent at constant currency) were supported by higher volumes led by the 812 Superfast, as well as the ramp up of the Ferrari Portofino and the 488 Pista. Additionally, pricing and personalization programs positively contributed along with deliveries of the Ferrari J50 and first deliveries of the FXX K EVO, which was partially offset by lower sales of LaFerrari Aperta. The erosion in Engines revenues (Euro 284 million, -23.8 per cent at current and constant currency) reflected lower shipments to Maserati, the statement said. Sponsorship, commercial and brand revenues (Euro 506 million, +2.4 per cent at current currency or +5.3 per cent at constant currency) were up thanks to stronger revenues from sponsorship as well as a higher 2017 championship ranking compared to 2016, partially offset by lower sales generated by other brand related activities. Currency, including translation and transaction impacts as well as foreign currency hedges, had a negative impact of Euro 105 million (mainly USD, GBP and JPY). 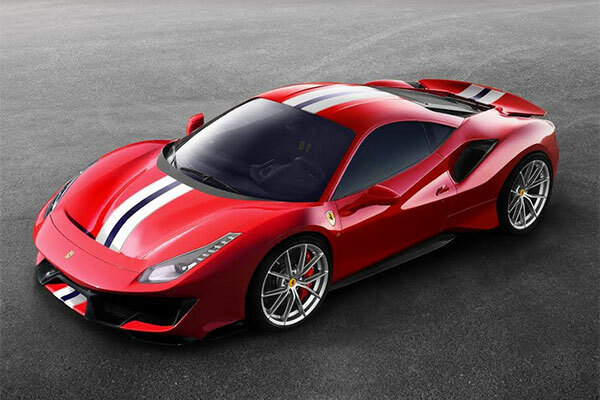 488 Pista: On February 21, 2018, the Group announced that it had selected the 88thedition of the Geneva International Motor Show for the world premiere of the 488 Pista, the Group’s successor to Ferrari’s V8-engined special series. The 488 Pista marks a significant step forward from the previous special series in terms of both performance dynamics and for the level of technological carryover from racing. The 3.9-litre V8 takes the “International Engine of the Year Award”: on June 5, 2018, the latest iteration of Ferrari’s turbo-charged V8 that equips, in various forms, all Ferrari’s V8-engined cars, received the award for the best engine in the world for the third year running in the 2018 International Engine of the Year Awards. Additionally Ferrari’s turbo-charged V8 was voted the best engine of the last 20 years. Ferrari takes the “Red Dot: Best of the Best” design award: On July 10, 2018, for the fourth year running, Ferrari received the “Red Dot: Best of the Best” award for the ground-breaking design of the newly launched Ferrari Portofino. The jury of international designers also assigned two Red Dot awards to Ferrari for outstanding design quality to Ferrari on the 812 Superfast and the FXX K EVO. 488 Pista Spider: On August 25, 2018, the Ferrari 488 Pista Spider was unveiled during the Concoursd’Elegance at Pebble Beach. The 50th open-top model produced by the Prancing Horse is the company's highest ever performing Ferrari spider, with a record power-to-weight ratio of 1.92 kg/hp. It combines the finest race-developed technological solutions with the joy of en plein air driving to deliver an exhilarating experience behind the wheel. The model’s engine, dynamics and aerodynamics are derived from two track cars: the 488 Challenge and the 488 GTE. The latter won the GT class of the FIA World Endurance Championship in 2017, thus giving Ferrari a total of five GT Manufacturers’ titles since the championship’s inception in 2012. Furthermore, this model has very clearly benefited from the extensive development work done to produce the coupé version, the 488 Pista.